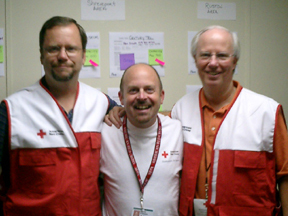 Pennsylvania pastor Dan O’Deens (center), was the “point man” for early FGBC relief efforts in Shreveport, Louisiana. Other members of the Advance First Responders Team included GBIM’s Dave Guiles (left) and Jay Bell (right). Pastor Dan O’Deens of Gateway Community Church in Parkesburg, Pennsylvania, played a key role from the start in the Grace Brethren response to Hurricane Katrina. As the Fellowship’s “point man on the ground,” he recruited, trained, and deployed managers from all over the Fellowship. Here is an edited version of a report he recently gave his church. Hurricane Katrina had hit, the worst disaster on American soil in our history. My heart was pulled toward the people–I knew their need was great. What does anyone do when 1.3 million people are displaced overnight?